A great way to finish and seal your work. Choose from 3 different finishes. ECO friendly Acrylic Professional Spray Can. 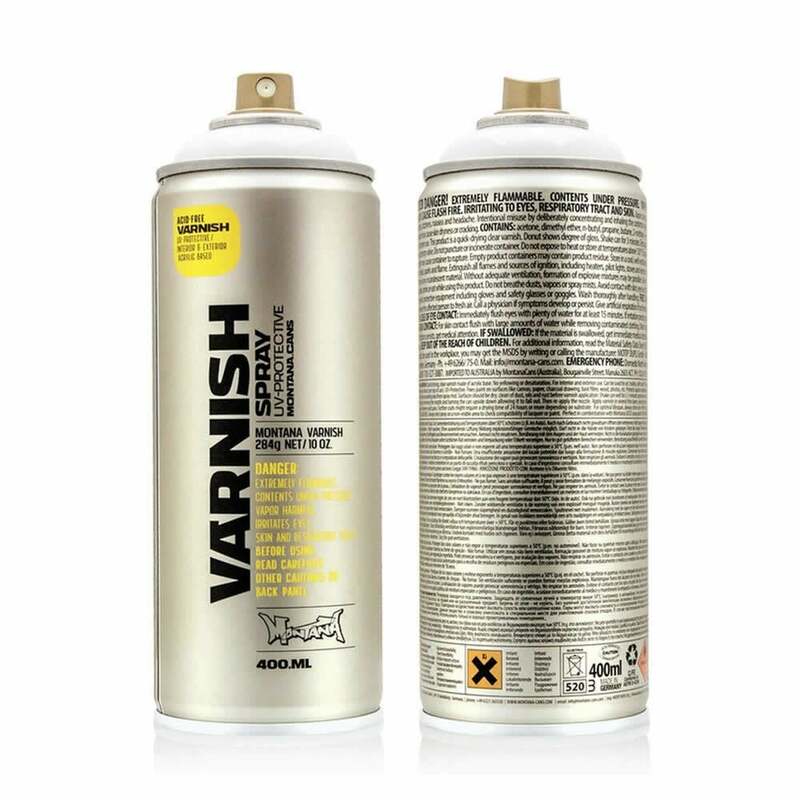 Suitable to spray on wood, concrete, metal, glass, plastic and canvas. A bit about the brand: THE PERFECT TOOL FOR CREATIVE WORK Montana GOLD is the perfect tool for all artists and creative workers. The specially developed Low-pressure system guarantees maximum accuracy to meet the highest requirements while giving professional results! High-covering and quick-drying acrylic lacquer. Montana GOLD allows for a new level of ease and control when painting with spray cans, with no cracking or colour bleaching. The new Montana GOLD color system has been completely overhauled and optimized by our dedicated team of artists and laboratory experts to make it perfect. We stock 45 colours opaque, metallic and transparent colours possibilities, Montana GOLD offers one of the largest and most concise colour range available in spray paint. Montana GOLD can be applied on canvas, wood, concrete, metal, glass or even flexible surfaces.